9334 Pitt Rd, Bonita Springs, FL.| MLS# 218072237 | Southwest Florida Residential Real Estate for Sale. Step into the cleanest, brightest, beach cottage-inspired remodel in Imperial Harbor, where you truly feel the Florida lifestyle. 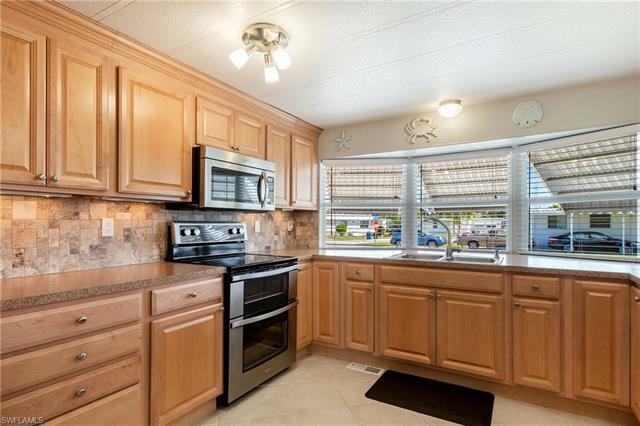 Convenient and quick 15 minute drive to Bonita Beach. All new kitchen, including cabinets with under-cabinet lighting, brand new countertops and custom back-splash, New Whirlpool stainless steel appliances including double oven! Just updated the entire electric system , freshly painted, re-grouted tile, second bedroom acts as a custom office with built-ins and under-shelf lighting, bathrooms partially updated. Enclosed lanai with window unit acts as a comfortable space for entertaining and out of town guests. New water heater in 2017, new washer/dryer, pull out windows. Two screened in lanais on each side of the unit with tile floors. Furniture in the unit is negotiable. New Roof with a lifetime warranty. Updated vinyl siding. New Amazon Metal hurricane rated shed 12x6 bought in 2017 included. Optional social membership of $1500 included, new owner then pays $300 per year if they choose to keep it. Imperial Harbor is an active 55+ deed restricted community where you own the land and pay no HOA.